Biologists cite excellent survival rates among the moose herd in northern Maine. AUGUSTA — Maine wildlife biologists on Wednesday proposed increasing moose permits for the 2018 fall hunt by 20 percent after gathering encouraging data on the herd’s survival this winter in northern Maine. The proposal would raise the number of moose permits to 2,500 from last year’s allotment of 2,080 – a reversal after four years of sharp decline. Moose-permit allocations had plunged from 4,085 in 2013, largely because of concerns about moose survival rates because of winter-tick infestation. The 420 additional permits this year would be allotted exclusively in Wildlife Management Districts 1 through 6 in northern Maine, an area roughly bounded by Houlton, the northern boundary of Baxter State Park and the northern end of Moosehead Lake. The proposal was made at IFW’s advisory council meeting Wednesday, where biologists detailed findings from the department’s aerial and moose-collar studies. The council will vote on the proposed permits in May, a month before the state’s annual moose lottery. Lee Kantar, Maine’s moose biologist, said the average number of ticks is down 68 percent in the study area around Moosehead Lake and down 67 percent in the study area in northern Aroostook County. Kantar said just one collared calf of 33 in the study died in Wildlife Management District 8 around Moosehead Lake, and none of the 35 collared calves died in District 2 at the northern tip of Maine. Kantar said the full extent of calf mortality caused by winter ticks won’t be known until May, when snow pack in far northern Maine has melted. The winter tick parasite has decimated moose herds in the Northeast and the Midwest. Maine’s moose population was estimated at 76,000 in 2011 and is now estimated at between 50,000 and 70,000, according to IFW. The moose-collar study, which began around Moosehead Lake five years ago and is now in its third year in northern Maine, allows biologists to find collared moose that die, collect data on the carcasses within 24 hours and determine the animal’s cause of death from a necropsy. Camuso said state biologists are already talking about increasing permits in 2019 dramatically in at least one hunting district where there has been higher calf mortality because of winter tick infestation. Such an increase would be used as a test to see whether culling the moose population in areas with a higher incidence of winter ticks can lead to a healthier herd. Advisory council member Jerry Scribner of Belgrade said such a measure would require education to gain public support. “There are going to be some people who are going to have to get used to not equating (a high) number of moose … with the health of the population,” Scribner said. Camuso said Vermont has used such an approach with good results. 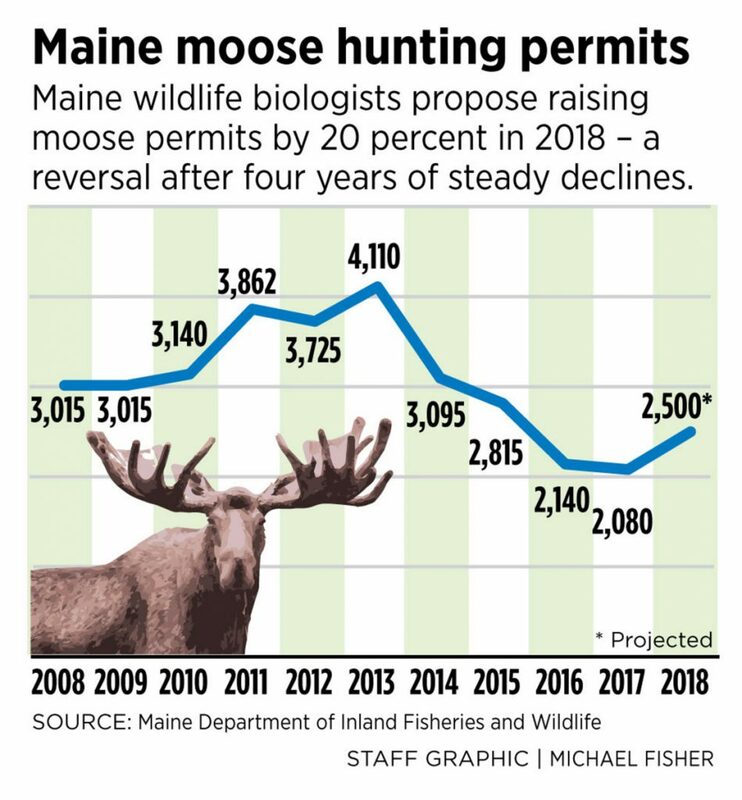 The proposed 2018 permit increase also includes a new measure that would allow hunters who win a permit in Wildlife Management Districts 27 or 28 in Down East Maine to use the permit in either district. Correction: This story was updated at 10 a.m. Thursday March 8, 2018, to say that no collared calves died in District 2.